I’ve really gotten into iPhone photography lately. Really, I’ve always loved the quality of the iPhone camera but with the new touch to focus, autofocus and video features I’ve really started using my iPhone over other cameras due to accessibility. With my iTunes gift card for Christmas I bought a lot of apps that are for photography or videography. I’ll be sharing my reviews soon but I wanted to share a website with you that I like to check in on about photography and the iPhone. 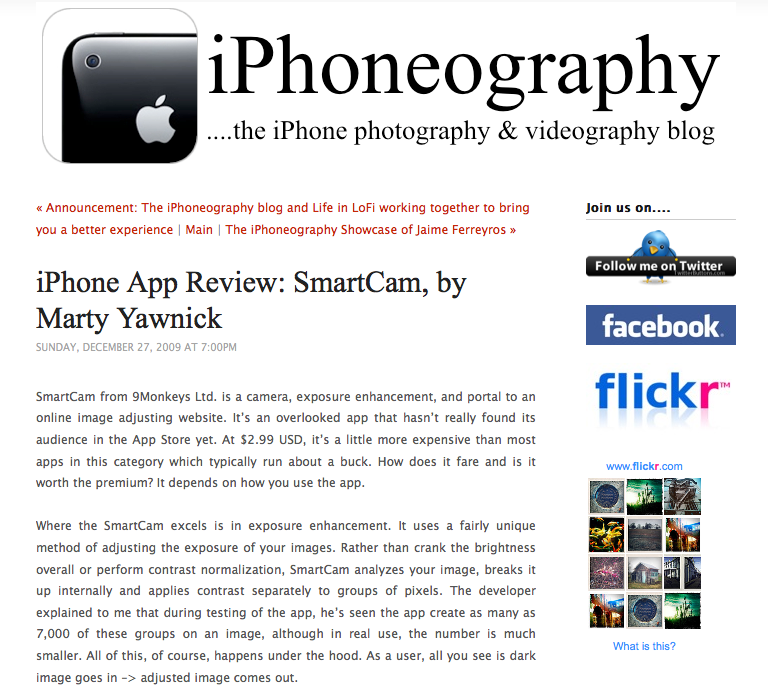 The site is called iPhoneography.com and is ran by Glyn Evans. He is a photographer, blogger, and has had careers in both photography (Kodak) and IT. Articles from the website include photography app reviews and announcements, videography apps and showcases of photographers’ work. There’s even a Flickr group. Check it out and let me know if you like it or are already reading it. This is a great site that I visit at least once a day. The information on all things iPhone photography has been invaluable. Mr. Evans has done an outstanding job and provided a great service. Thanks. you website seems to have chinases language edition ! hha !